Your Website Had Me At Hello! Many business websites are all about the business. And I get it. They want people to know they’re the best at what they do, so they tell them. The thing is, people aren’t searching to find out how great a business is, or read about their credentials and awards they’ve received. Think about your own experience. Let’s say you’re in need of a new widget. So you search for widget providers. You click through to a website that looks promising – and it’s all about how great they are at providing widgets. They’ve provided widgets to thousands of customers. They’ve received lots of training, and awards for their widget providing excellence. In short: why they’re all that & a bag of chips. Do you feel like they will take good care of you as a customer and provide you with the widget service experience you’re seeking? What if instead you saw that they can solve the problem you’re having? How they back their widget with service and support so that you’ll not only have a new widget, you’ll have help making sure the widget is working well for you. Sure, they have info that tells you they’re widget experts, although their focus on solving your problem is what makes you decide to purchase from this widget provider. Are you ready for your website to stand out to your ideal customers so they know right away that you’ll provide the right solution for them? 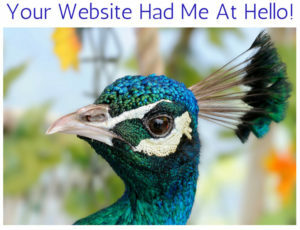 If you said yes – either in your head or right out loud – then Your Website Had Me At Hello is for you! Your Website Had Me At Hello is a combination website checklist, planning guide and worksheet + a detailed website review and personal consultation with Webb Weaver Debbie Gadbois to get tips, recommendations, and answers to your questions. If you already have a website, it will help you revitalize the content, look and layout. If you’re getting started with a new or redesigned website, it will help you launch a website that connects with your ideal customers. Debbie will reach out by the next business day via your provided email address to schedule your personal consultation. Please note: Your order will be processed securely by PayPal (no PayPal account required). Due to the nature of this resource, purchase of Your Website Had Me At Hello is non-refundable.